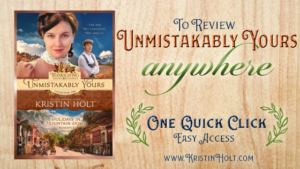 For purchasers and readers of Unmistakably Yours in paperback form, this page provides access to the links both within my website and elsewhere online, as provided in the “Dear Reader” (A Note from the Author) section in the back of the novel. Please notice that the BLUE text, within the note, below, are links– click on them to open the linked content. This content is accessible to readers of the kindle edition, complete with links, at the back of the ebook format. I enjoy writing books set in the 1880s—a time where people were pitted against some of the greatest natural weather disasters—and thus able to show their strengths. 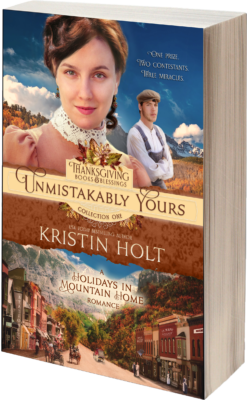 This title, Unmistakably Yours, was a perfect opportunity, as the many authors in this series each wrote a book focused on Thanksgiving Day (and all that this holiday means to Americans) to revisit my favorite fictional city—Mountain Home (and series: Holidays in Mountain Home). Thanksgiving has a special place in my heart. “Thanksgiving”, as Americans know it, is unique—though it began as a Christian celebration within a Christian colony in the New World, the United States became a true “melting pot” with immigrants coming from all over the world, and of many different religions. To Americans (United States citizens), Thanksgiving is an opportunity to reflect upon the abundance and gifts of the past year. As a Christian, I see Thanksgiving as an opportunity to express thanksgiving to God for His infinite blessings. Beyond Thanksgiving, this novel includes a look at Harvest Celebrations/Festivals, and their place in American history. In the Western United States, these small-town festivals included many of the same events and entertainments I’ve drawn upon, and many more. As mentioned in the foreword, the nineteenth century definition of “love-making”— including “lovers” was very widely used as a G-rated term that simply meant those who have a romantic attachment, and those who are falling in love and courting. Running water in the new 1886-1887-built Abbott’s Brick Block? I’ve discovered numerous newspaper clippings that elaborate on the types of clubs women formed, that helped form the Ladies’ Library Association that once met in Jane’s Tea Room. 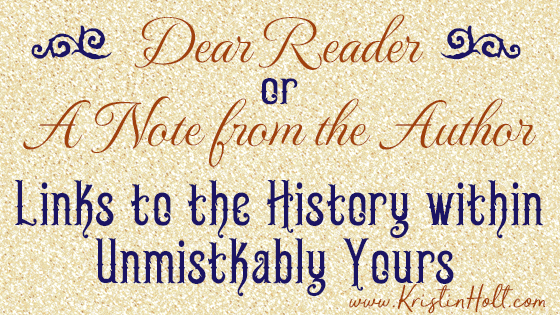 Watch for an article to be published on my site, that I’ll include a link to within my Unmistakably Yours page. I’ll update this page for everything related to this title, Unmistakably Yours. More blog post articles, more historical tidbits, more details that help to set the stage and enrich your reading experience of all titles set at the same time. Please visit my ever-growing cache of articles that help to fill out the setting and historical background for Unmistakably Yours. Many blog articles are already cataloged there, and I’ll add more as they become available. Note: You’ll find much more information (some of it overlaps) on my Unmistakably Yours Page. 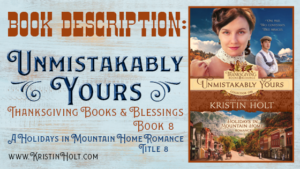 Have you read Unmistakably Yours? Please consider leaving a review, to help other readers find this book, and inform their buying decisions. Here’s the link to make leaving a review online super easy!